NEW ORLEANS – Collegians stepped up in a big way on the outdoor track & field circuit this past weekend. 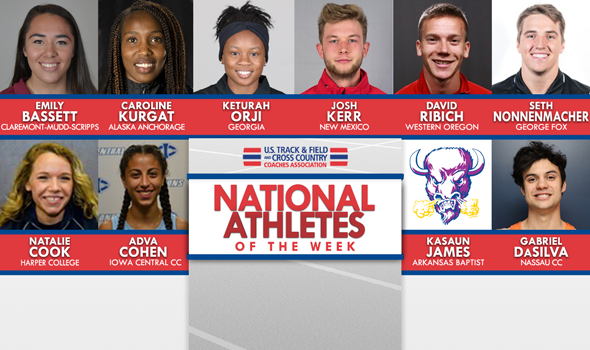 Here are those athletes who stood out the most and were named National Athletes of the Week by the U.S. Track & Field and Cross Country Coaches Association (USTFCCCA) on Tuesday. Josh Kerr came agonizingly close to breaking Sydney Maree’s collegiate outdoor record in the 1500 last year at the Bryan Clay Invitational. Kerr left nothing to chance one year later. The two-time NCAA mile and reigning 1500-meter champion left vapor trails on the track in Azusa, California, broke the tape in 3:35.01 to win the elite competition. Maree’s standard of 3:35.30 had stood since 1981 before this past weekend. Syracuse’s Justyn Knight finished runner-up a full second behind Kerr. Right now Kerr has two of the top-7 marks in collegiate outdoor history in the event. His record pushes his previous PR of 3:35.99 to seventh on the all-time chart. This is the second time in the past two years that Kerr has been named National Athlete of the Week during the outdoor season. Season-opening attempts in the triple jump agree with Keturah Orji. During the indoor season Orji set the collegiate record with her first try at the Clemson Invitational. This past weekend in her debut at the Mt. SAC Relays, Orji bounded 14.33m (47-0.25). That mark is good enough for second in the collegiate outdoor record book behind her current PR and current collegiate record of 14.53m (47-8). Later in the series, Orji added the fifth best mark in collegiate outdoor history of 14.27m (46-10). Orji is also ranked fourth nationally in the long jump this season with a mark of 6.53m (21-5.25). This is the third year in a row that Orji has been named National Athlete of the Week during the outdoor season. David Ribich made history this past weekend at the Bryan Clay Invitational, breaking the NCAA Division II outdoor collegiate 1500 record. The senior from Enterprise, Oregon, ran a 3:37.35, surpassing the previous record of 3:38.91 set by Mount St. Mary’s Kip Cheruiyot in 1987. Ribich finished sixth overall at the meet, behind New Mexico’s Josh Kerr and Syracuse’s Justyn Knight, among others. This is Ribich’s fourth National Athlete of the Week honor this year, as he also picked up the award three times during the indoor campaign. This is Kurgat’s first National Athlete of the Week honor for track & field, but the junior from Eldoret, Kenya, won the award three times during this past cross country season. Seth Nonnenmacher chose quite the time to PR. Competing at the Northwest Conference Championships, Nonnenmacher unleashed a titanic throw to beat archrival Andrew Bloom of Whitworth. Nonnenmacher launched the javelin 71.48m (234-6) on his first attempt to capture the conference crown and move into sixth place on the all-time NCAA DIII chart. Prior to this past weekend’s effort, Nonnenmacher had a javelin PR of 69.22m (227-1) that he set last year in a winning effort at the NCAA meet. Nonnenmacher is the second male athlete from George Fox to be named National Athlete of the Week during the outdoor season (Vernon Lott on March 27). Before this past weekend, Emily Bassett had never broken 60 meters in the hammer throw. That all changed at the Beach Invitational. Bassett heaved the chained implement 62.04m (203-6) to finish ninth in the invitational section of the meet and moved up to third on the all-time NCAA DIII chart. That puts her right behind record holder Whitney Simmons and Keelin Godsey, who sits second all-time. This is the third year in a row that an athlete from Claremont-Mudd-Scripps has been named National Athlete of the Week during the outdoor season. Kasaun James was fast at the Arkansas State Red Wolf Open over the weekend. The sophomore won event titles in both the 200 and 400 against a field comprised mostly of NCAA Division I athletes. In the 200, he ran a wind-aided 20.42, beating the likes of 2017 NCAA Division I Outdoor Track & Field All-American Jaylen Bacon. That time was the fastest in NJCAA Division I this season. James followed that up with 46.51 in the 400, good for third on the NJCAA Division I Descending Order List. This marks the first National Athlete of the Week honor for James and for Arkansas Baptist. This shouldn’t even come as a surprise to anyone, as Adva Cohen has been absolutely dominant during her freshman campaign. This past weekend, the native of Jerusalem, Israel, ran a 16:07.03 in the 5000 at the Kansas Relays, setting a new NJCAA Division I collegiate outdoor record while shooting to the top of the Descending Order List in the event. Cohen placed second at the meet behind NCAA Division I All-American Sharon Lokedi of Kansas. This is Cohen’s second National Athlete of the Week honor for the outdoor track & field season, having won a week ago. However, she also picked up three awards during both the indoor track & field season and the 2017 cross country campaign. Gabriel DaSilva put himself atop the NJCAA Division III Descending Order List in one event, and moved himself very close to first in another after his outing at the 13th Annual all American Invitational. The sophomore from Albertson, New York, ran an NJCAA Division III-leading 1:57.38 in the 800 while adding a 4:06.94 in the 1500, good for second in NJCAA Division III this season. This National Athlete of the Week honor is DaSilva’s second of the 2018 outdoor track & field season. Natalie Cook notched three top-three finishes at the 2018 Cougar Invitational this past weekend, including a victory in the 1500 that doubles as the best NJCAA Division III mark on the season. The product out of Algonquin, Illinois, ran a 4:57.70 in the 1500, defeating athletes from the NCAA Division II level. She also added a 2:23.16 in the 800 while helping the 4×400 squad post a 4:18.00, which the latter of the two ranks second on the NJCAA Division III Descending Order List this season. This National Athlete of the Week honor is Cook’s second of the 2018 outdoor track & field season.